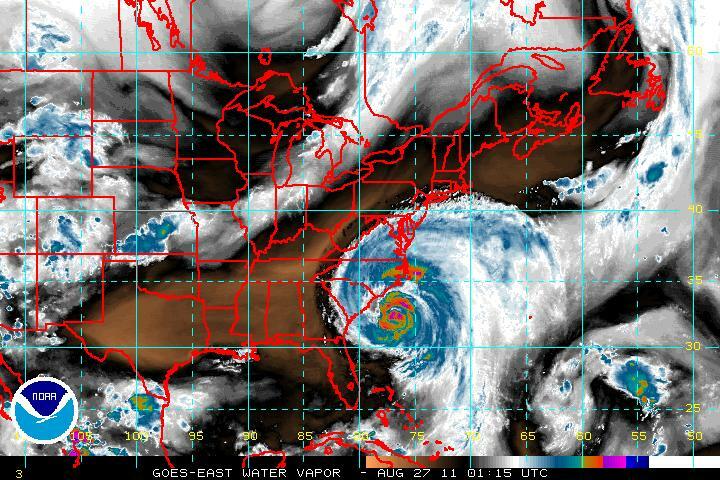 As of 10 pm EDT, it appears as though Irene continues to weaken as the dry environment is too much for the storm to overcome. The water vapor image below shows the dry air (orange-red area) to the north and west of the storm being drawn into the circulation. The satellite presentation looks weak, though the spiral banding makes this an interesting looking storm. Forward motion is now north-northeast or 15 degrees at 14 mph. This should bring the storm ashore just east of Cape Lookout, NC. As you can see above, the white clouds are being interrupted by dry air getting in towards the center of the circulation. This has been preventing an eyewall from forming and thus we are left with a gradually weakening system. It is currently moving over the Gulf Stream and convection is coming in bursts. This should continue up through landfall with some supercell thunderstorms noted going through the southern Outer Banks (around Cape Hatteras) in the last couple of hours. The vortex message from the Hurricane Hunters has found a pressure of 951 mb and winds of only 68 knots (79 mph). It is possible that the hurricane is stronger than this, but I don’t personally think we have anything stronger than a CAT 1 right now. 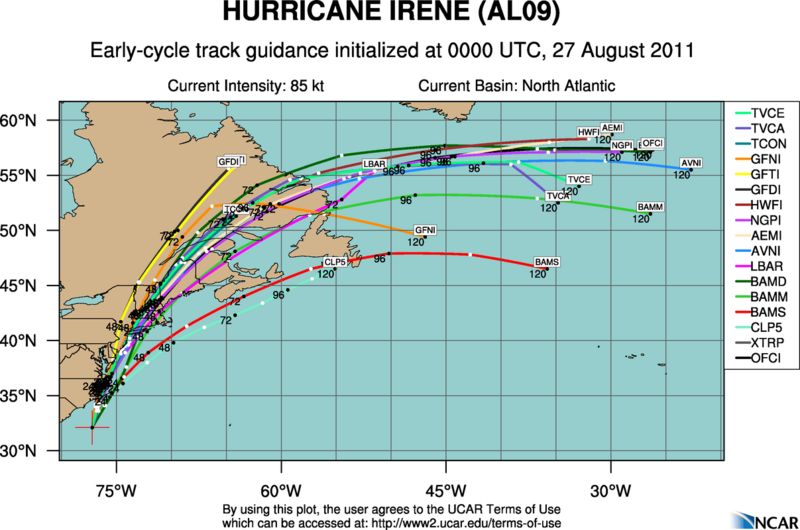 The track guidance still looks good for the storm making landfall tomorrow morning (between 8 and 10 am EDT) and moving up towards the Mid-Atlantic by evening. The storm should be picking up speed with latitude, so it looks as though conditions will go down hill overnight into Sunday morning for the NJ coast with heavy rain and strong winds. My forecasted wind impact is for sustained winds of 45-55 mph with gusts to 75 mph possible. . .higher near the coast. This is very similar to a strong nor’easter with a significant storm surge. I have no problem with the NHC forecast track. I like the HPC guidance for rainfall for NJ of 10″-12″ with isolated 15+” totals possible. Personally, I would be surprised if this is still a hurricane by the time it gets to NJ, but I emphasize that you should still take this storm very seriously. Storm surge and heavy rainfall will be a deal! I’ll post an update tomorrow morning. I hope everyone has prepared themselves and I wish you all good luck. Why the medias and politicians are exaggerating it so much. Based on your model look like it is not a big deal when it gets to NYC? I don’t want to make it sound as though the media or politicians cried wolf. To put it this way. . .I don’t see wind being greater than a strong nor’easter, but with saturated soil and winds gusting to 70-90 mph, that will topple trees and cause power outages. The evacuations were risky, but with a large surge expected, I think it was a good idea (especially considering the past). Do I think this will be anything like the strong hurricanes of the past, not right now.